More than a year ago Andrea Deák asked us to help to interpret a postcard from a Hungarian collector of WWI Jewish relics, Gábor Izsák, on which Galician Jews greet with their Torah scroll the commander in chief of the Austro-Hungarian army. The date – 9 November 1915 – was found out by Deák Tamás on the basis of contemporary press; the historical background was provided in part by the KehilaLinks, who then also quoted us back; and the Hebraist Két Sheng, an expert of the role played by the Jews in WWI, sent us some similar photos from Erwin A. Schmiedl’s Juden in der K. (u.) K. Armee, 1788-1918 (Eisenstadt: Österreisches Jüdisches Museum, 1989). And today Kálmán Dániel drew our attention to the above photo published by Yvette Métral – another of our long-time readers – on the Yiddish Florilège, one more, hitherto unknown Galician example of the welcoming of a commander in chief with a Torah scroll. 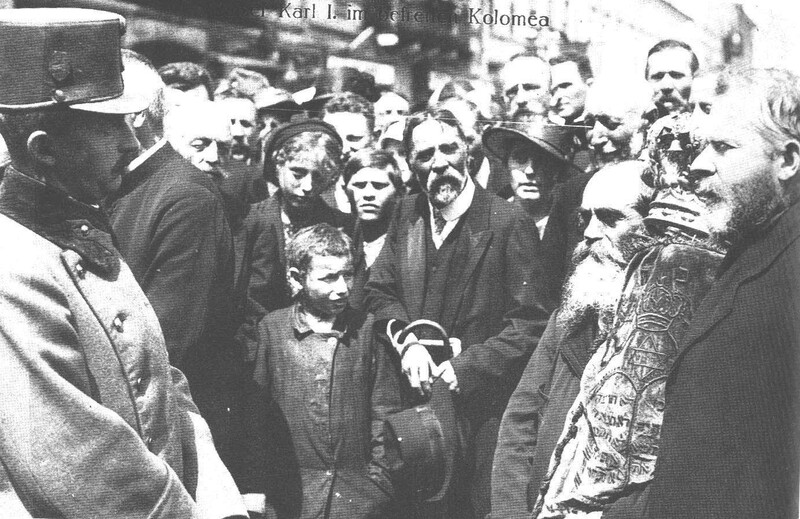 Just on this day, when – on the request of Héjoká – we have written about Kolomea concerning a very different matter. We also commented on the Florilège, which was then looked at by many of our readers. Then we asked Deák Tamás, who within a few minutes, figured out that the festive event took place on 4 August 1917. Well, río Wang is fed by such sources. Thank you all. “In the summer of 1917 the Russian front collapsed again, and the Austrians returned to Kolomea. Before the war, in 1911-1912 Archduke Charles of Austria lived with his wife in Kolomea, serving there in the same regiment of dragoons as dr. Chania, he as a lieutenant, and Dr. Chania as a lieutenant-doctor. The two lieutenants were friends. With the return of the Austrians, Charles also came to Kolomea, this time already as an emperor. In the summer of 1917, Emperor Charles on entering Kolomea was welcomed by a delegation of the inhabitants in front of the town hall. When Krysia Chania [a daughter of the mentioned dr. Józef Chania; my comment] greeted the emperor in beautiful German, handing him over a bouquet of roses, the emperor kept this bouquet, while he put the other bouquets aside. He thanked her, and endowed her with the imperial brooch with the letter “K”. Dr. Józef gave Charles welcome in his home. The emperor spent there the evening and one night”. Illustration of the Polish memoir: Archduke Charles as a captain of dragoons in front of his house in Kolomea, 1911-1912. I found only a Czech version as source of this visit. “In the summer of 1917 the front collapsed again and the Austrians returned to Kolomea. Before the war, Archduke Charles of Austria lived with his wife in Kolomea serving there in 1911-1912 in a regiment of dragoons together with dr. Chania. He as a lieutenant and Dr. Chania as a lieutenant-doctor. The two lieutenants were friends, and with the return of the Austrians also Charles came to Kolomea, this time as an emperor. In the summer 1917 Emperor Charles entering Kolomea was welcomed by a delegation of the inhabitants in front of the town hall. When Krysia Chania [a daughter of the mentioned dr. Józef Chania; my comment] greeted the emeperor in beautiful German, handing him a bouquet of roses, the emperor kept this bouquet, while other buquets he was putting aside. He thanked her, endowing the imperial brooch with the letter "K". Dr. Józef gave Charles welcome in his home. The emperor spent there the evening and one night”. 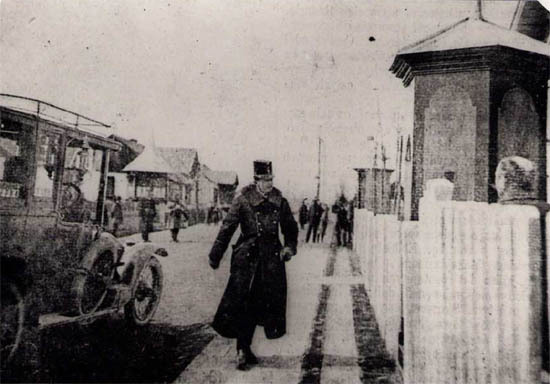 Additionaly to the text on this site, the photo of Archduke Charles von Habsburg is added with such a signature: “Emperor Charles as a captain of dragoons in front of his house in Kolomea, years 1911-1912”. Thank you very much, Pawel! Apart from being an extremely interesting and very fitting addition, it is also a perfect illustration of how precious sources feed the río Wang. I will immediately include it in all versions. Thanks again, and I’m also counting on your precious help in the future.